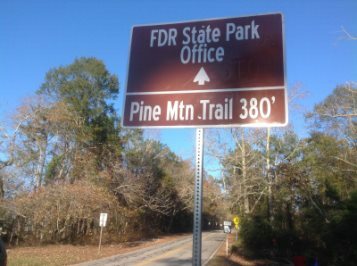 How do I get to FDR State Park and the Pine Mountain Trail? The FDR State Park office is at 2970 Ga. Highway 190, Pine Mountain, GA 31822. It is located just off I-185 near Callaway Gardens, west of Warm Springs on Ga. Route 190, or south of Pine Mountain off U.S. Hwy. 27. If you still have questions, call Jim Hall at 706-569-0497. The FDR State Park office is open 8:00 a.m. - 5:00 p.m. Monday-Thursday, 8:00 a.m. - 8:00 p.m. on Friday, and 8:00 a.m. - 6:00 p.m. on Saturday and Sunday. 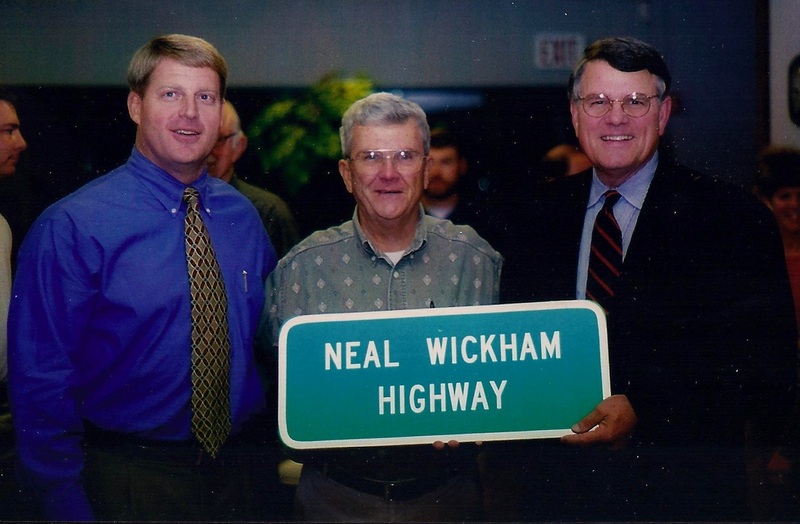 There are Neal Wickham Highway signs on GA 190. Who is Neal Wickham and why was the road named for him? The highway was named after D. Neal Wickham in his honor in late 2000, as founder of the Pine Mountain Trail who spent thousands of hours with its planning and clearing from 1975 till the trails completion working with many volunteers weekly and alone. He then began maintaining and adding loops and did so till about 1994 when he turned over maintenance to Carl Carlson. He proposed and laid out the last addition to the trail system (The White Candle Trail) and saw its completion in 2006. He remained active with the trail association board till his death on May 18, 2016 at age 86. There is a commemorative rock and plaque at the trail's end (Mile 23) that was put there in his honor in 1995 (the 20th anniversary of the trail) and by that year it was estimated that 1 million hikers had hiked some portion of the trail. On October 15, 2016 a new trailhead info kiosk next to the commemorative rock was dedicated as "NEAL'S REST". There would not be a Pine Mountain Trail if not for D. Neal Wickham. He has inspired hundreds of volunteers to carry on what he started. ​How do I get a map of the trail? The easiest way is to go to the on-line store and order a real printed on Tyvek topo style map. Maps are mailed free to Scouts and groups (schools and churches) along with individual students and active military folks by mail from the PMTA only. Since we send groups/military maps FREE, we do have to limit those to two per group or one per individual please. NOTE: if you forget and leave your map at home and arrive at FDR State Park without it, you need to purchase/buy another. They are NOT free at the park office. Note: when we reply we got your request, we will email you some information to please read over before coming on the trail. CLICK HERE to order free maps if you are eligible. Do I have to pay to hike or camp on the Trail? There is no charge just to day hike, but you will need to pay to park and backpack overnight in a designated site. Parking is $5.00 seven days a week* (called a USE FEE) unless you have an annual Georgia Park Pass to park anywhere in the park. Backpackers will pay $10.00 per day per person for a backcountry camping permit (groups of 6 or more their the group permit is $50.00.) NOTE: see SITE DESCRIPTIONS for capacity of sites, especially in regards to groups. *Wednesday used to be FREE PARKING days in Georgia state parks but no longer. 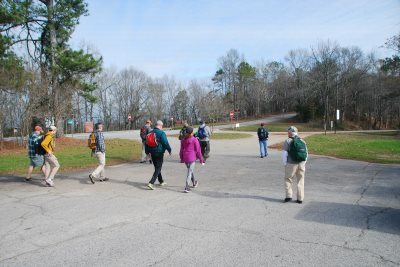 Do I have to be a member of the Pine Mountain Trail Association to hike or camp on the trails? You do not have to be a member to hike or backpack on the trails. You do have to pay to park and obtain a backcountry permit to camp. The backcountry camping permit fee is waived for PMTA members (individual and organizations). Do I have to be a member of the PMTA to participate in the monthly group-led hikes or the workdays? What is the Georgia State Parks and FDR rule on alcohol use in the park? Alcohol beverage use (the consumption of beer, wine, or liquor) of any type is not permitted anywhere in the backcountry (campsites or trails) nor at any of the road-side picnic areas (nor outside of rental cabins). If you come to a backcountry campsite and find evidence of alcohol use (i.e. empty bottles or cans) before you arrived, report this to the park rangers right away. Dogs are allowed as long as they remain on a leash that's 6 foot or less in length at all times outside your vehicle/RV or rented cabin anywhere in FDR State Park. If you have a retractable leash, clamp it down/tie it off to 6' max. There are reminder stickers/signs at all trailheads telling of leash rule and noted on back of our map. This is a Georgia Parks/DNR rule not a PMTA one. Dog owners reported and seen by the FDR Park Managers/DNR rangers without leashes on their pets can be issued a citation. NOTE: Service Dogs must also remain on a leash/tethered and held on to at all time per DNR rules. If hiking with a dog, and you come upon other hikers, pull to the side off the trail path and let others pass you and your pet. Dogs may wear a "doggie backpack," but no pack animals are allowed, including donkeys, horses or llamas (yes, really). By the way, the leash rule applies to cats too (yes we've seen folks with cats on the trail). Some have asked, "Why have dogs on a leash if I walk with him at home off leash?" ......Main reason is it is a GA State Park rule, period..... SAFETY is main reason for 6' max leash rule. Some folks don't interact with dogs at all or well. Seeing a dog off leash scares them. Also dogs can smell things on the trail that they may not have smelled and run off (animals chasing a wild animal is called "wildlife harassment".....and you can end up with a lost dog. Are mountain bikes and other things with wheels allowed on the Trail? No wheeled vehicles/carts, thus anything with a wheel of any kind are not allowed on the Trail: powered, ridden or pushed, including bicycles, wheelchairs and strollers and wheeled coolers. Are remote controlled (RC) vehicles allowed on the trails? No remote controlled (RC) vehicles along the trails (this includes the RC "trucks/cars".) There are "no wheeled vehicle"/no bike reminder stickers posted at all trailheads. GA State Park rules also state NO aerial RC drones allowed anywhere in FDR State Park. Are there places to fish anywhere along the Pine Mountain Trails? Are horses allowed on the Pine Mountain Trail? No horses allowed on the Pine Mountain Trail anywhere. No other pack animals of any kind allowed either. There are some horse-only trails that intersect with the Pine Mountain trail. They are not on the PMT map so be aware of them in several places: near mile 7, several places on the Sawtooth Trail, near mile 18.5, mile 19, mile 19.5, and mile 20.5. Horse trails are clearly marked with "no hiking" symbol stickers and the PMT has carsonite signs with "no horses" at/near the intersections of the PMT and a horse trail. When is the Pine Mountain Trail open? During annual deer hunts (usually first Monday and Tuesday in December in even number years, the park will be completely closed to all other activities. Next hunt has been move to early 2019 actually......Park and Trail will be closed on January 7-9. The WJSP-TV tower parking lot and trails area around it could be closed if work is being down on the tower or if ice forms on the tower or guy wires. During extreme weather conditions it is advised to call the park office (706-663-4858) and ask before coming to the park if there are going to be any closed areas or if the park will be totally closed during the days you plan to come hiking or backpacking. Is hiking or running the trails before daylight or after dark allowed? ? Is climbing allowed on the Wolf Den cliff at Cascade Falls? No climbing on face of any cliff area in FDR State Park, especially the Wolf Den Cliff area. There are signs noting this. I heard a tornado hit the trail in April of 2011. I hear also the trail is back open totally, but where exactly did it hit the trail and where can I expect to see damaged area and how much? The trail was hit in several places, doing some 24,500 feet of damage. Mile 22.5-22 there was 2,150 feet of damage. The Beaver Pond Trail north of Ga 190 had 1,773 feet of damage and south of Ga 190 1,878 feet (along with 950 feet on the White Candle Trail. Mile 15.2 east had 3,838 feet of damage. Mile 13.2 eastward had 4,485 feet of damage. Mile 12 eastward for 7, 556 feet was hit all over completely (including Bethel Creek Campsite). Can I hike by myself? Yes, although the Trail is very well marked, we recommend that you always hike with a friend for safety. We suggest you buy a PMT map and read our Trail Safety section. Trailheads have wooden directional signs and there are wooden signs at each trail intersection and each of the backcountry campsites. Along the trails there are 2" x 6" rectangle painted blazes on trees about 72 to the mile or so. The main Pine Mountain Trail is blazed in blue. The Mountain Creek Trail in red. All named connector trails are blazed in white (as are trails to the backcountry campsites.) In some places along the trail there are two blazes (shown in photo). 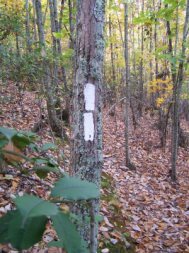 Double blazes on a tree denote a change in trail direction*, intersection with a connecting trail or an intersection with a horse trail or road. * A change in direction means a hard right or left hand turn that comes up just beyond the double blazes. How far is it from FDR State Park office to the Trail parking lots? Buzzards Roost Parking Area - Turn left (west) out of the parking lot. .65 miles on the left. Overlook Parking Area - Turn left (west) out of the parking lot. 1.65 miles on the left. Fox Den Cove Parking Lot - Turn right (east) out of the parking lot. 1.4 miles on the left. Mollyhugger Hill Parking Lot -Turn right (east) out of the parking lot. 3.6 miles on the left. 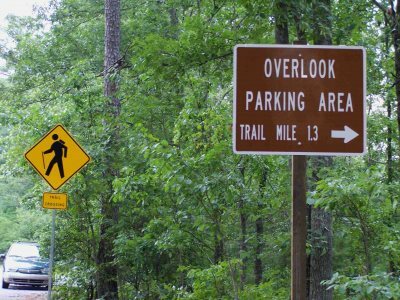 Boot Top Trail Parking Area (On Dowdell Knob Road) - Turn right out of the office parking lot, and turn right after 5.8 miles onto Dowdell Knob Road (watch for the sign). Boot Top Trail Parking area is on the left .3 mile south. Dowdell’s Knob Trailhead and Parking Lot - Turn right (east) out of the parking lot, and turn right after 5.8 miles onto Dowdell Knob Road. (Watch for the sign.) Dowdell Knob trailhead and parking lot is 1.3 miles at the end of this road. Rocky Point Parking Lot- Turn right (east) out of the parking lot. 7 miles on the right. Liberty Bell Swimming Pool- Turn right (east) out of the parking lot. and go .4 miles to Ga. 354. Turn left onto the ramp for 354 right before the stone bridge. At the end of the ramp, turn left and go .4 mile. The entrance to the pool parking lot is on your right. Trading Post- Leave the parking lot and go straight across the road to Lake Delano Road leading down the mountain to the RV campground and cabins. Follow the road across the dam at the lake, and the Trading Post will be ahead on your left. What are the urgent access route signs along the trail? There are some old logging roads within FDR State Park and some newer ones that are NOT hiking trails but lead to places along or near the Pine Mountain Trail and backcountry campsites. They are being marked with RED carsonite (flex fiberglass signs) and kept open for use in getting to an area by the FDR Rangers quickly using an ATV in a rescue situation or to control a forest fire. With permission, the PMTA has used these routes also to haul in bridge parts and signs. Main thing, they are NOT on the PMT map and are marked as "URGENT ACCESS ROUTE - Park use only" with "No Hiking" stickers on in the woods ones, and at paved road access points there are stickers noting no hiking, no biking, no ATVs, and no horses. What is the latest in the day I can get a backpacking permit? Permits are issued no less than 2 hours before dark. If you get there late in the day, find a motel in the area or get a permit to stay in a tent site in the RV campground. If you are a group, the Pioneer area may be available. Are there age limits for backpacking on the Trail? You or one person in your group must be 18 to obtain a backcountry permit from FDR State Park. Is there water available on the Trail? There are several places along the trail (marked with a W on the trail map) where water is most of the time at backcountry campsites. There are other trail/stream crossings. All water found in the streams and springs along the Trail must be filtered, treated or boiled, but you can fill water bottles at the park office and RV campground. We recommend you check with the park office for water availability at backcountry campsites. For hiking, you should always plan on bringing enough water with you. Are campfires permitted along the trails? Campfires are permitted only at designated, named campsites in the existing fire-rings. Occasionally, when fire danger level and condition ratings are prime for a forest fire, a fire ban is enforced on the PMT. We will post FIRE BAN notices on this website. You will be told about any fire ban when obtaining your backcountry permit, but be sure to check with the park office before leaving home and be prepared for stoves only cooking if there is a fire ban. When in effect, fire ban signs will be posted at most trail-heads. When fires are allowed build campfires in designated fire-rings only. Don't build a new fire-ring or move one. Keep fires small. Use only wood that is dead and down on the ground. Do not take wood from standing dead trees. Most certainly, no living or standing tree dead or alive of any size should be cut in FDR State Park for firewood or any reason. Axes are not needed. A small folding or bow saw is all you need. Most importantly, fires should put out properly. See our backcountry camping section for the correct way to put out a fire. Are there any wild animals on the Trail? You will likely see deer, turkey, fox, small birds and squirrels. In early 2002 a bear or two were seen, but there were no reports later in the year and there have never been problems with the bears. Do I need to hang my food and such like in bear country? Since there are raccoons, possums, armadillos, and mice in FDR State Park along the trails, it's a good idea to hang food and scented items at least 6' off the ground (including your trash bag) at night. Wash all food prep utensils and pots before retiring to your tent. Put uneaten food in a "stump hole" about 200' from tent sites. Don't leave your boots outside your tent at night (critters mentioned could chew on them, and spiders could get in them). I am a Pine Mountain Trail Association member and I lost my card. What now? Call PMTA membership chairman Jerry Brown at 706-324-9422 or Jim Hall at 706-569-0497. What happens if I get lost/hurt or come upon someone who is ? If you are completely off the trail, the best thing to do is STOP as soon as you realize you aren't on the trail any longer. Rest a couple minutes, take a breath and gather your wits. Try to backtrack a short ways to see if you pick up the trail. If you do not, STOP. If you have a cell phone call for help. On the back of PMT map are two 24 hour numbers for the FDR 24 hour Rangers. Main number is 706-663-4256…(do not call 911 first as you will only get a 911 center that will call the park rangers.) You can also try another number which is a GOOGLE VOICE number. 706-801-5006. You can make a voice or text call to this number, or voice and it will transpose it to a text. If you have cell service on a smart phone you can also go first to our website www.pinemountaintrail.org and click on the first tab LOST ON THE TRAIL. Follow the prompts using Google maps and you will see a map and it will show you where you are. "Screenshot" a photo of that map then when you call the rangers you can also text the park rangers that photo of the map and they can see exactly where you are (or the person who you come upon.) Below is sample map showing Dowdell's Knob. Otherwise, whistle, yell for help, but stay put and let help come to you. Most good hikers carry most of the following on a hike: A very loud whistle, real flashlight (not just light on cellphone), means for starting a fire, small amount of food and ample water, cell phone, small first aid kit, and a piece of plastic for shelter, map and compass. 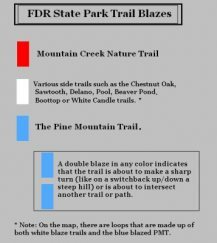 Look at the Pine Mountain Trail map before heading out, make sure you plan your hike to be off the trail before dark and watch for the appropriate color blazes on the trees. NOTE: The park rangers/DNR enforcement ranger may request you accept their FIND A FRIEND request if your phone is capable of accepting that. With FIND A FRIEND the rangers can see on their Iphone or Ipad where you are on an interactive map. What is the elevation of the highest point on Pine Mountain? The highest point in FDR State Park (on Pine Mountain) is 1,395 feet. There are three U.S. geological survey benchmark markers near the Dowdell Knob Trailhead. The main one is 15' from the right of trailhead shelter. They were placed there in 1930 and found to be GPS accurate! 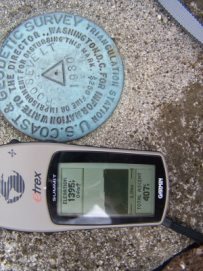 So if you need to calibrate your GPS for altitude, you can do it there. 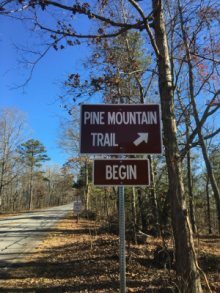 Are there any restrooms on the Pine Mountain Trail? Sorry, but no. The closest facilities are in the RV Campground and the FDR park office. The RV Campground is near the Mountain Creek Trail, and the office is near mile 4 of the Trail. Other than that, just lots of trees. Note: On group-led Pine Mountain Trail Association hikes, we ask the guys to move ahead while the girls stay back and go in private. Bath tissue can be left in woods and covered with leaves after you go. Women should bring a zip-lock bag to take out items (tampons and pads) that will not decompose. What is considered trash that needs to be taken out of the woods off the trail and or not burned in a campfire? While hiking, water bottles-plastic food/candy/snacks wrappers, cans, glass, cigarette butts (in other words just take everything man-made you bring in on the trails/to a campsite.... take back out in YOUR trash bags. If backpacking and have a campfire, don't put/try to burn anything in a campfire except maybe paper and if you do....make sure it burns up. DON'T bring charcoal or wax based fire-starters to use at a campfire ring. They do not burn down and leaves a mess. Please don't bring/use candles and set them on a rock to burn and melt down. Backpackers will be given a free Pine Mountain Trail Association heavy duty plastic trash bag when they obtain their backcountry permit at the park office. What if I lose or find something on the Pine Mountain Trail? ​Who or what cut all those limbs along the Trail? In the fall, when the leaves are falling along the trails, many folks see a bunch of freshly cut small hickory limbs in and along the trails. If you look closely, these hickory limbs had the ends cut neatly. Was there someone who was pruning these hickory limbs from trees? No. The cut limbs were the work of a 15-18 mm long insect known as a twig girdler (oncideres cingulata). This long-horned wood boring insect lives in many hardwoods of Florida and attacks pecan groves in particular. The hickory of our area is a cousin of the pecan. The twig girdler doesn’t do any real damage to the trees along our trails, but does provide some interesting conversation. What happens is a female twig girdler selects a hickory twig (usually about 3/8” in diameter) and she chews the bark and some of the inner wood around the entire twig, almost to the point that the limb is separated from the tree. This causes the limb to die. This process is called girdling, hence the name. In a notch in the circular cut, the female then lays her eggs. The larvae, when they appear, eat more of the now decaying wood. After the larvae pupate and become adult beetles they leave the limb. As the limb is now dead, drying out from being cut all the way around, when the wind blows the limb then breaks off from the tree. Most times the leaves are still attached to the broken off branch. We have seen a few small hickory trees the twig girdler has cut the top out of, and most times the tree continues to grow and branch out with the top cut clean off. So the next time you are hiking on the PMT, look for small limbs along the trails with ends cut, and you'll know a twig girdler has been there! What birds might I see on the Trail? The Pine Mountain Ridge, which F.D. Roosevelt State Park encompasses and Little White House sits on the northern end, has been recognized as an Important Bird Area by the Audubon Society. Click here to see a checklist of birds for FDR State Park. Who do I contact if I find a downed tree blocking the trail or other trail condition that needs attention including a smoldering fire at a campsite or campsite trashed or missing trail sign ? For things like trashed sites or fires contact the park rangers via the emergency numbers on the back of the PMT map. 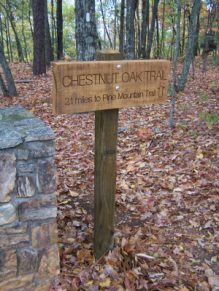 For trees and other trail condition situations call the park office and at the bottom of our website homepage is CONTACT US so please write us and let us know too (and if you will call Jim Hall at 706-569-0497.) If you will take a photo, email that to us . Photos help us determine if a chainsaw is needed or more than one person needed for trees. Best exact location of downed trees is VERY important. If you have cell service in the woods on a smart phone you can also go first to our website www.pinemountaintrail.org and click on the first tab LOST ON THE TRAIL. 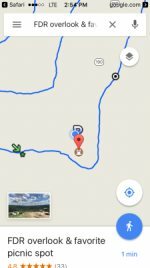 Follow the prompts using Google maps and you will see a map and it will show you where you are on the trail. "Screenshot" a photo of that map then email that photo to the PMTA. What kind of elevation changes can one expect along the Pine Mountain Trail? Here is a list of some places along the trails from west to east with their elevations. There are some switchbacks along the way, but not too long or steep. All the below are on the topo style PMT map. See the elevation map below, as well.